Which kitchen appliance features sharp blades that spin at incredible speeds: A blender or a food processor? Well, both, actually. But while blenders and food processors have many similarities, these appliances serve some very different purposes. A blender is typically better for liquids and is used to create things like smoothies, while a food processor is used for more labor-intensive tasks, such as mixing dough or slicing vegetables. Of course, some blenders are powerful enough to handle the tasks meant for a food processor (and vice versa). For now, however, let’s just take a look at the basic differences between a blender and a food processor. If you’ve ever shopped for a food processor, you’ve probably noticed a long list of the appliance’s skills listed on the package, including chopping, slicing, shredding, mixing, and pureeing. While blenders have become more capable over the years, they still don’t do much more than blend. 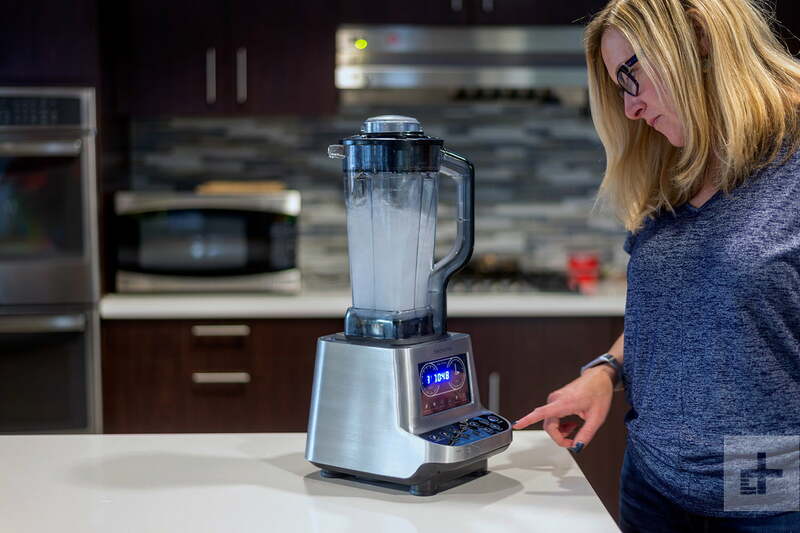 Sure, a powerful blender will crush ice, and top-of-the-line blenders like the Vitamix 5200 are capable of making everything from ice cream to nut butter, but your typical blender isn’t going to be able to handle the number of tasks that a food processor can. As you can see in the chart above, there’s a considerable amount of crossover between these appliances. However, they both excel at different tasks. Blenders, for instance, are typically built with features that make them ideal for making smoothies. While some blenders have easy-to-pour reservoirs, others are made so that you can drink out of the same cylinder that you use to make your smoothie. Blenders also handle liquids much better than food processors, which makes them ideal for making soups or other light sauces. The Magic Bullet NutriBullet, for example, can whip up a nutritious smoothie with ease. While we wouldn’t recommend it for making butters and breads, it is powerful enough to grind up nuts, veggies, and other potential smoothie ingredients. Food processors, on the other hand, are ideal for more labor-intensive tasks, like making dough. Food processors have wide mixing bowls — which make it easy to add in ingredients — and typically come with various attachments, giving you the ability to slice carrots, shred cheese, or mix dough. The Hamilton Beach 10-Cup Food Processor is a good example of what you should expect from this type of appliance. It has a large mixing bowl, a pulse setting, multiple speeds, and blade attachments for slicing, shredding, and chopping. It also comes with a “bowl scraper,” an attachment that automatically scrapes sticky doughs and batters from the walls of the bowl. Whereas a food processor is a great tool for bakers, a blender is a great choice for someone who likes a liquid lunch (either cocktails or smoothies). But what if you want both? There used to be a pretty clear line between blenders and food processors, but that isn’t the case anymore. It’s not uncommon for high-end blenders to be sold with multiple attachments, which gives them the ability to tackle a number of extra tasks. The recipe book for the Vitamix 5200, for instance, includes smoothies, nut butters, bread dough, cocktails, and cake mixes. So what appliance is right for you? Simply speaking, a blender is a better option for items with a lot of liquid, like smoothies and soups, and a food processor is slick for thicker items like doughs and butters. And since the line between food processor and blender has, well, blended, you can find high-end appliances that handle both tasks admirably.